How big a deficit should the Saudi Arabian government run? British terror suspect Samantha Lewthewaite, described by the press as the “White Widow” and is alleged to have masterminded the Nairobi mall massacre last week, is believed to have paid for fake passports to enter South Africa, reported the Daily Mail on Tuesday. A convicted fraudster has said that the British-born convert spent about $2000 for the documents and it is suspected that she used them to set up home in South Africa’s capital, Johannesburg. Interpol issued a “red notice,” an alert for an “international wanted persons” for Lewthwaite last week at the request of authorities in Kenya following the attack claimed by al-Shabaab militants. Security measures in South Africa have come under scrutiny after the reports Lewthwaite was able to fraudulently obtain a passport for her and two of her children, reported the Mail. The attack on the Nairobi Westgate mall killed some 67 people and wounded many. Gwede Mantashe, secretary general of the ruling African National Congress, highlighted the need for change in a recent statement. Ehmed Chisty, who is currently serving a 37-year jail sentence for arranging thousands of fake documents, says the “white widow” came to him for a forged passport. 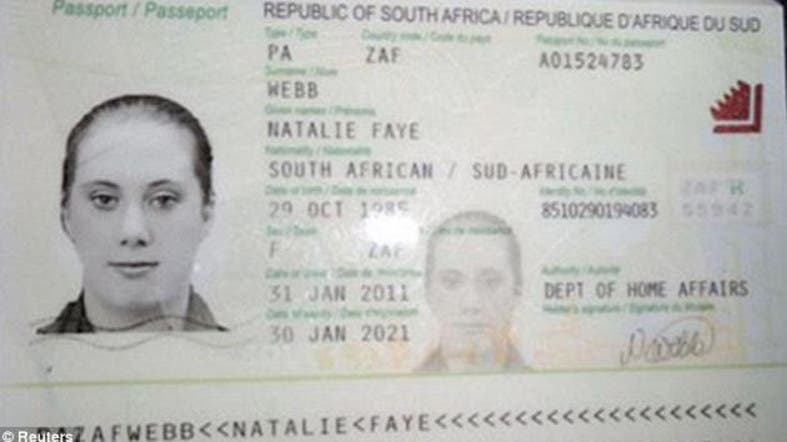 Lewthwaite used a fake passport under the name Natalie Faye Webb to apparently set up home in the country. Recent reports claim that she may have worked with a second jihadist from Britain, but this has not yet been confirmed. It is alleged that Umar Arshad, a high-ranking member of al-Qaeda worked with Lewthwaite to mastermind the atrocity, according to the Mail. Muslim convert Lewthwaite is the widow of 7/7 suicide bomber Jermaine Lindsay, who carried out the terror attack on British soil. She allegedly fled her home in the UK in 2009 and is thought to be on the run in East Africa. Can Egypt’s slums be replaced by ‘safe zones’? 2019 Copyright. Al Arabiya Network.